King’s Saddlery is a complete Western tack store. We have a large inventory of merchandise for the cowboy, cowgirl and city-slicker! 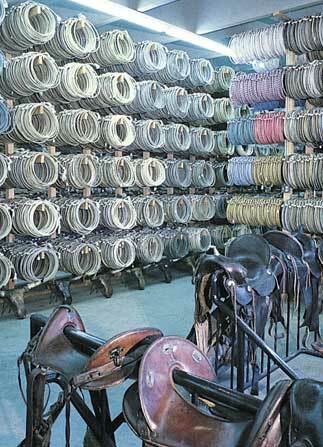 We carry a wide selection of saddles, ropes, bridles, bits, headstalls, reins, halters, roping equipment, barrel racing equipment, saddle bags, saddle blankets and slickers... to just name a few of our items. Stop in and check out our huge selection of Western gift items including jewelry, dishes, frames, knickknacks, many horse related instructional video tapes and books! Visiting Sheridan, Wyoming? Be sure to put The Don King Museum on your list of GREAT things to see and experience! The Don King Museum is truly a must see!